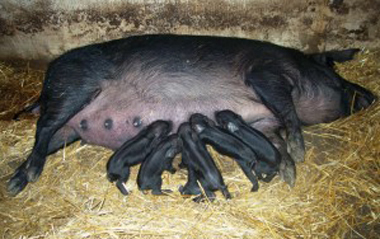 The Black Salvonian is a nearly-extinct Croatian pig bred for their meat. At the end of 19th and beginning of the 20th century they were developed by the crossing of Mangulica, Berkshire, and Poland China pig breeds. Due to the small litters that the sows have, they are not popular with breeders and they today there are less than 200 in the world.